Direct to Consumer (D2C) brands and Digitally native vertical brands - Everything you need to know in one place! Understand the evolution of D2C brands, identify the winners and emerging companies, track digitally native vertical brands – all on an auto-pilot! 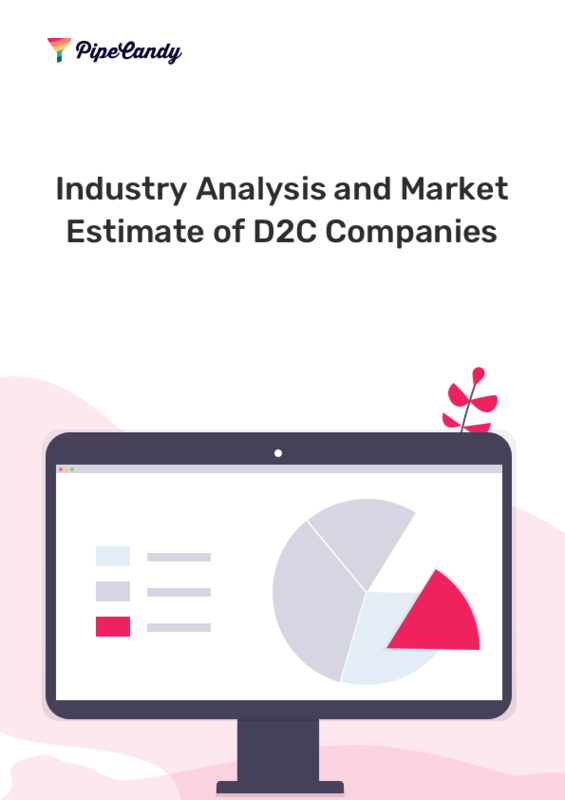 Download PipeCandy’s report on the D2C brands market, growth trends, and market sizes for major categories like D2C cosmetics brands, Direct to consumer apparel segment, D2C jewelry etc. Get answers to questions like ‘how many D2C companies are there?’. Find insights on D2C brands by popular categories like ‘Direct to consumer shoe brands’(with coverage on brands like Allbirds), ‘Direct to consumer apparels’, hot travel D2C brands (like Away) or the mattress category with popular brands like Casper, emerging categories like ‘athleisure’ etc. Find which D2C brands are growing, which ones consider D2C as a distribution strategy and which ones are truly digitally native. Differentiate between long-tail eCommerce companies that are brands with no buzz from emerging D2C brands that are likely to win. Acquiring or investing in the D2C space? Identify all the D2C brands in the categories of your interest, track their historic growth metrics, discover who is buzzing and predict the winners. Work with us to build your custom ‘D2C brand index’. Subscribe to the complete data set of D2C brands & eCommerce companies & year-long signals about them. Find answers to every question you have about the global & US Direct-to-Consumer market size & other such insights. Hi! It took us months to find the right data provider for us. We were desperate to find the marketing insight and edge to stay in the pack against our competitors. PipeCandy came to us with their leading algorithm-based technology to get us the info we needed, pinpointed exactly where we needed to focus on (product comparison analysis and R&D) and delivered far beyond expectations. Identify all the D2C companies and Digitally Native Vertical Brands. Get early access to our upcoming D2C index!